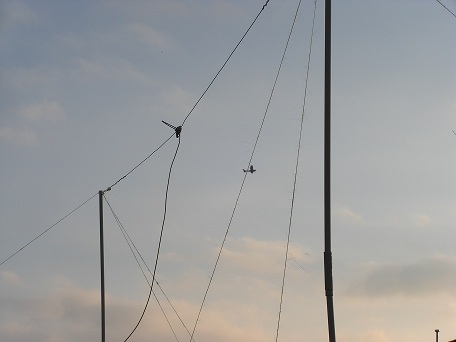 I managed to set this 10-m dipole antenna in my back yard a few weeks ago and made a handful of contacts with it working the band over the course of about an hour. I had some help creating the antenna. The mast was simple, I used two sets of two-by-5′ (10′ tall) electrical conduit PVC pipe guyed on each mast with baling twine. It worked like a champ with my Yaesu FT-847! 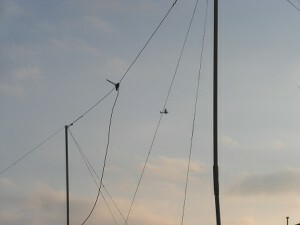 This entry was posted in Amateur Radio. Bookmark the permalink. Did some of the romad-ness rub off on you? You’re darn right it did! You won’t catch me falling by the wayside! How’ve you been!? It’s good to hear from you?